There is a Sannadhi for Chakravarthy Tirumagan (Sri Rama) at the foot of the temple. Valmiki came over here and worshipped Ranganatha, Trivikrama and Nrisimha atop the hill and meditated on Srirama besides the Pushkarini. Ranganatha, Lakshmi gave darshan to Valmiki as srirama and Seetha, Adisesha as Lakshmana, Shanka and Chakra as Bharata and Shatruguna; Vishwaksena as Surya and Garuda as Hanuman. At this request of valmiki, the Lord took the form of Neervanna Perumal at this Kshetra. The Kshetra is called the Neermalai as the water surrounded the hill completely for a long time. Tirumangaipuram is a place nearby where Tirumangaiazhwar resided for some time. The moolavar is Neervannan, Neelamugilvannan seen in standing posture facing east. Moolavar (Irundhaan) - Saantha Narasimhan seen in seated posture facing east. Moolavar (Kidandhaan) - Ranganathan seen in reclining maanicka sayana posture facing south. Thaayaar - Ranganayagi faing east. Moolavar (Nadandhaan) - Tiruvikraman seen in standing posture facing east. Theertham - Manikarniga Thdaakam - Sheera Pushkarini, Kaarunya Pushkarini, Siddha Pushkarini, Swarna Pushkarini. Features It is said that Bhoothathazhwar had His incarnation in the Pushpa Nandavanam(Flower Garden) of this temple. The world-famous Thirukazhunkundram is near this Kshetra. This is popularly known as Shore Temple by the tourists all over the world. The Perumal gives his seva in four different positions. 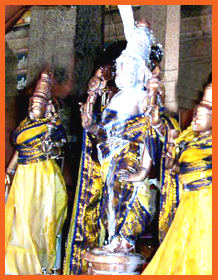 Lord Narasimhar - Irundha Thirukkolam. Lord Ranganathar - Kidantha Thirukkolam. Lord Thiruvikrama - Nadantha Thirukkolam. The Neervannar is found in Nindra (standing) thirukkolam facing his Thirumugham towards East direction. He is also named as Neelamugil Vannan. Prathyaksham (seva) for Thondaimaan, Brighu Munivar and Maarkandeyar. Lord Ranganathar is found in Kidantha (lying) position facing his thirumugham towards South direction and the Sayana kolam is referred to as "Manicka Sayanam". He is lying on the Aadhiseshan under Ranga Vimaanam. This Divyadesam is one among the sthalams found in Thondai Nadu. 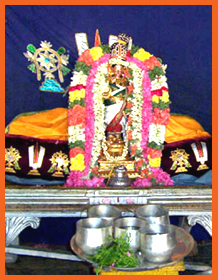 In this Sthalam, the Perumal is found is various positions as Nindraan, Irunthaan, Kidanthaan and Nadanthaan Thirukkolam. This Sthalam is situated in Tamil Nadu, Chengulpet District. We can reach the temple by travelling around 4 Kms from Pallavaram Railway Station, which is about 7 Kms from Chennai.